We manufacture graphic overlays for most industries and applications including “process measurement and control industries”, “automotive”, “medical” and domestic appliances. Materials are selected to relate to each application and include PVC, polycarbonate and polyester. Specifications account for chemical and scratch resistance and special features include flexibility, insertable legends, embossed areas and serializing systems. Sub panels are available in aluminum, stainless steel and rigid plastics. Our colour matching systems ensure reproduction of customer colour standards. Quality is assured by first off inspection, process inspection and 100% final inspection. The term “overlays” covers fascia for control panels, which can be made from a wide selection of materials and as result a range of manufacturing processes. 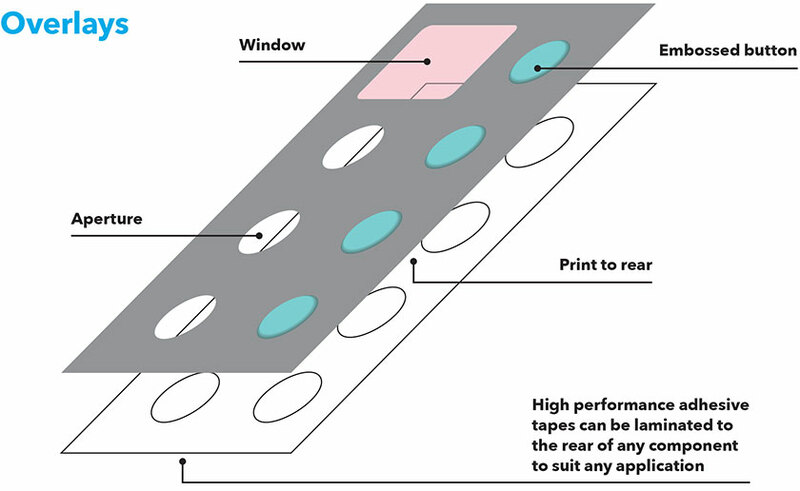 Generally overlays are made from polyester or polycarbonate, printed to the desired requirement by either screen or digital printing and if required buttons can be embossed. Overlays in more extreme environments can also be manufactured with laminates, aluminum or in some cases stainless steel. To produce such overlays a selection of processes from engraving, etching or Anodized Aluminum may be used.